We finally have an understanding of how Mars transformed from a once habitable, Earth-like planet into the dry world we see today. 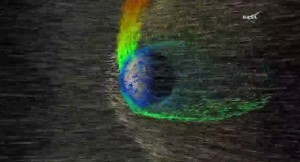 NASA researchers have just announced that Mars’ once rich atmosphere was stripped away by solar winds in the early days of the Solar System, causing the planet to dry out. Solar winds blast out from the Sun at around a million miles per hour (about 1.6 million km/h), and fortunately Earth is protected from these by our magnetic field. But although Mars used to have a magnetic field, it lost it as its planet cooled down billions of years ago, and that allowed the ions in its atmosphere to effectively be blown away.